Today's slim, svelte computers look great. You, on the other hand, look like a total yutz fumbling around to plug a thumb drive into a USB port that's somehow perpetually upside down. What if saving your data was as easy as slapping a sticky note on your screen? That's what a design team proposes with this highly theoretical design for paper-thin, sticky memory cards. Designers Aditi Singh and Parang Anand theorize that a single layer of graphene sandwiched between two flexible protective layers could provide up to 32GB of storage space. A sticky edge would carry data from an optical data transfer surface conveniently built in to the edge of your computer monitor. Of course is completely theoretical and in no way buyable, but it's a nice dream. Graphene is a wonder material, to be sure, but graphene-based consumer products are still a long, long way off. 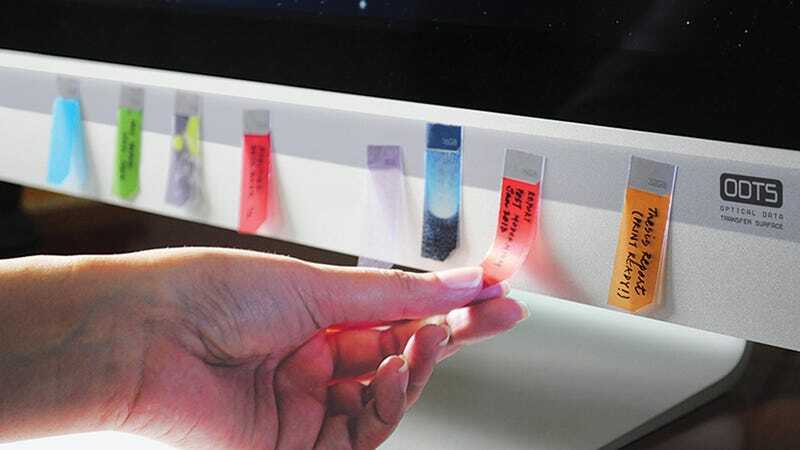 And while the designers do an admirable job of explaining how the sticky notes themselves could (someday, possibly) work, they leave the Optical Data Transfer Surface—the engine that makes the whole process possible—completely mysterious.